I was sent an e-mail pitch asking if I'd be interested in reviewing Befriend, a new title by Scott Sauls, published by Tyndale House Publishers. I'm usually always up to read a book about friendship as there always tends to be room for improvement. The book arrived and I launched right into it. 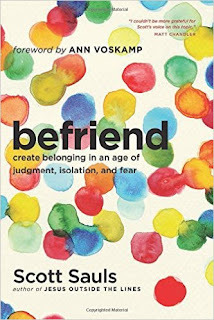 Befriend is a relatively short book containing twenty-one chapters. It can be devoured in a few sittings but was designed with the idea in mind to use as a devotional or a group study. I read it in about four different settings, taking in a small chunk at a time. This main idea behind this book is to encourage the reader to reach out and show love and friendship to others in a world that doesn't really "do" relationship away from a screen. It's a call to think more of others than yourself and to be willing to build bridges to people who maybe do not think and act exactly as you do. As he points out, he's easy to be friends with people who are just like you and who like the same things you do. It's much harder to be friends with those who are different. Certainly this a challenge and a topic worthy of its own post. Sauls opens his book with the first chapter pointing out that it's going to be hard for you to love others unless you can love the person you see in the mirror. I see what he's getting at, of course, but I have to say that the whole "love yourself" argument rubs me the wrong way most of the time and so I mentally held the book at arm's length at first. My hesitation on the whole "love yourself" way of thought is that it tends to make us selfish and self-focused to the detriment of all other relationships. I've heard the phrase, "I need to focus on me" too many times from people and I find that a more destructive attitude than a helpful one. Sauls' message that he wishes to communicate is that, in Christ's eyes, we are all "enough" so we shouldn't try to avoid being friends with others because we are ashamed of ourselves or because we think we are less than others. I agree with him, I think I just use more caution in the way that is all phrased and argued because people are quick to hear, "I need to love myself" and slow hear "I need to die to self so that others might live." And, really, a genuine relationship with anyone requires a bit of death to self. Beyond arguing that you should make friends with people who are not like you, Sauls also spends a lot of time arguing why and that's important. This is necessary work on Sauls' part because we humans are a stiff-necked lot and easily get bogged down in the mire of What We Like. The older I get the more I understand why I need Scott Sauls-types in my life to encourage me to peep outside of my own little box in order to see the world at large. It's so easy to live (and to want to live) in my own bubble where I'm not ever flustered or made to interact with a person or situation that makes me uncomfortable. But Jesus didn't call us to be comfortable, did He? Instead He issued a challenge to look for opportunities to go above and beyond in reaching out to others and to serve them. It's a difficult call which is why not many people do it. If it was easy to all get along then we would. We don't because it isn't and because we don't want put down our own prejudices and see what the other person might be trying to say. For the silent ones who feel alone and ignored, Sauls has written this book to share why it's important to break down the walls so that we can reach one another for the glory of the Lord. All in all, I found this a beneficial read. I must tell you though that I received an ARC of this and it was missing Chapter 20 which is entitled, "Befriending the Opposite Gender." This is a topic that I would find hugely interesting and would rather have liked to have heard what Sauls had to say. I didn't have that chance and so my opinion of this book isn't entirely completely. That explained, I do have 90% happy thoughts towards this read and no hesitations in recommend it to you. It contains a lot of good food for thought. The temptation surrounding Befriend is going to be in wanting to have other people read it so that they will know better how to treat you. Resist the temptation to think that way. (I mention this because I understand the temptation quite well!) If you're going to read it, read it for yourself and make applications where necessary. Sure, there may be a speck of the inconsiderate in the eye of your friend, but get rid of the log in your own eye before thinking about them. Many thanks to Ravū Collective who sent a copy of this book my direction in order to facilitate this review. I received no additional compensation and all opinions are 100% my very own. I would have the same reservations about chapter one. I don't think there is any place in the Bible we are told to love ourselves - it assumes we already do ("love your neighbor as yourself," etc.). I agree with the points you brought out there, also that there has to be some dying to self in relationships. Sounds like an interesting and valuable book!